HAUTE LIVING - If you’re looking for an extended weekend escape, Napa Valley is one of the best places to visit in the country. With an abundance of things to do and see, restaurants to dine at, and wineries to visit – there is nothing short of extraordinary experiences awaiting at every turn. Check out our luxurious yet concise guide that will allow you to maximize your time exploring the area. Whether you prefer a small boutique setting or a sprawling all-encompassing resort, Napa Valley has a variety of accommodations to choose from. 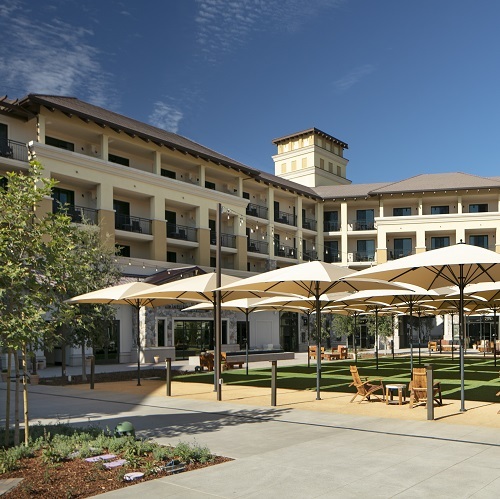 One of our favorites is Napa’s newest luxury property Vista Collina Resort. Nestled amongst the rolling hills of Napa, Vista Collina Resort has brought in a new way to discover Wine Country all from one location. Featuring authentic, Tuscan-style décor, a tasting Village, a locally-sourced, artisanal market, 25,000 square feet of meeting and event space, and a spacious 16,000 square foot community lawn for catered picnics, lawn games, and private concerts – there is something to do at any given moment. The Village serves as the heart of the resort and brings the best from the area into a unique and full Napa experience. Surrounding the expansive lawn are nine tasting rooms, an upscale artisan market, and a Food & Wine Center making The Village a destination all in its own. The wineries operate independently from the hotel property so non-hotel guests can enjoy the wine offerings and event activations as well.